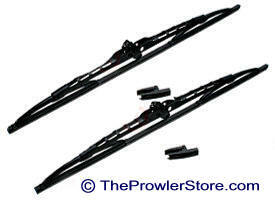 Custom fit for the Prowler this is the wiper to get for best performance. Exclusive Quiet-Glide™ micro-finish wiping edge delivers a cleaner wipe and quieter operation. 17" and 19" set of blades. 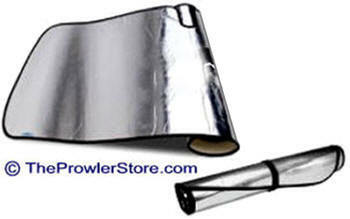 Exclusive fx dual rubber compound reduces chatter, provides superior wiping performance and provides longer life. Exclusive fully-enclosed metal tension spring delivers more direct pressure to the wiping edge for improved moisture removal and reduced streaking. - Set of 2 TOP OF THE LINE! Includes 19" and 17" as required. Top of the line wiper blades for sports cars. PIAA's Silicone blades actually coat the screen's surface with a microscopic layer of silicone. So, unlike any other wiper, they repel water giving clearer vision and improving safety. From the initial design process to extensive laboratory testing under the harshest conditions, PIAA blades outperform every other blade currently on the market. The Super Silicone Wiper Blade offers better resistance to all climates - heat, ozone, ultra-violet, and wear - clearly outperforming the industry standard. They eliminate squeaking and reduce drag, regardless of the shape of the windshield. 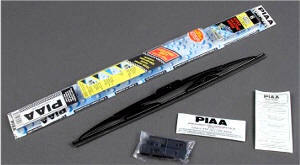 The Super Silicone Wiper Blade maintains a sharp, clean edge, even after 230,000 operations. PIAA has engineered unparalleled effectiveness and streamlined operation into every blade - qualities that ensure superior performance. This design features a satin black finish with the PIAA logo discretely printed on the metal blade support - they look superb. Best Blades you can BUY! 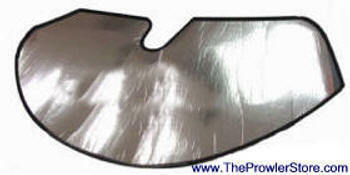 Custom fit for the Chrysler/Plymouth Prowler Windshield. 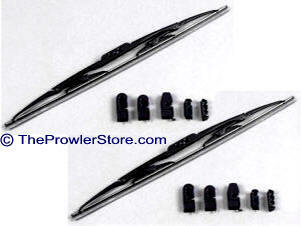 Includes Prowler Kat Logo in Black - size may vary. Protect your Interior - Keep it COOL!